My friend Tony was the first person I knew who liked 10cc. Of course I liked them too but you couldn’t admit that, certainly not in the self-conscious-80s, especially if you didin’t want your head kicked in 🙂 . In the second show of the wonderful BBC Radio series ‘ The Record Producers ‘ they took a look at the recording career of 10cc. I knew a little about them but didn’t realise just how DIY they were. These guys wrote, played, arranged, produced, engineered. They did the lot. 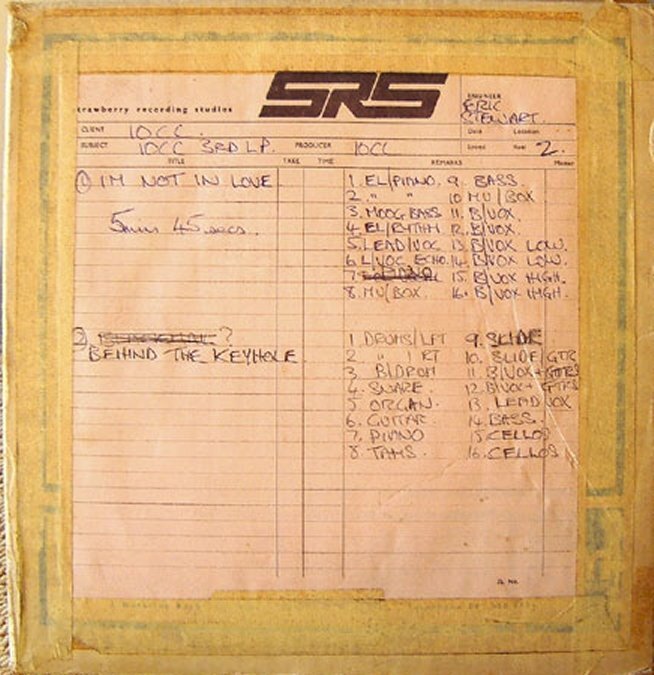 The programme featured analysis of multitracks , probably the most interesting aspect for me, including the legendary multi for ‘I’m Not In Love’. Are the legends true? Can you really see through that multi because they overdubbed so many times ? Not mentioned in the programme. But what is mentioned is the technique they used to get those stacked harmony vocals throughout the song. I won’t spoil the surprise. While looking for the image above (the original master tape for I’m Not In Love) I found this article from Sound On Sound magazine. Remember, big boys don’t cry. Link to an MP3 of the programme in the first comment. Enjoy.